The Battles of Baghdad ? There were no battles. For the British troops taking the city in 1917 was, surprisingly, a piece of cake. Twentyfour years later, in 1941, they took the city again, this time by sheer bluff. Conquering Baghdad city is not a big deal, as became obvious again in 2003. The real problems always came afterwards. The lesson that politicians and generals time after time forget is: After breaking a regime in the Middle-Eeast you have to face the population and they, the people, are much more dangerous than the regime itself. This is the forgotten story of what happened to Baghdad. In the Great War 1914-1918 the Ottoman (Turkish) Empire had sided with the Germans and Austrians. The Turks held Mesopotamia, “Land Between the Rivers” Tigris and Euphrates, since 1534 and they had a firm grip on many of the Persian and Arabian oilfields. Britain wanted that oil for its large navy. But in the first years of the war the Ottomans defeated the British everywhere. 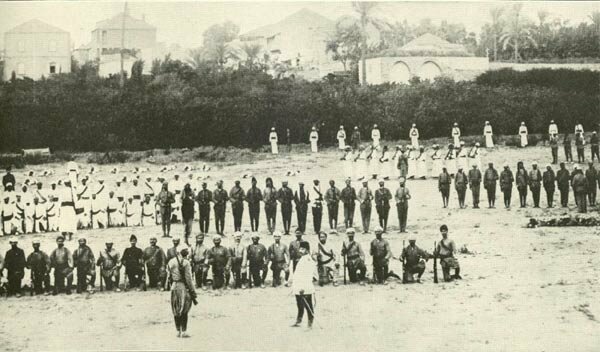 In 1916, beaten down by flies and mosquitoes and hampered by swamps, 13,000 diseased and demoralized British and Indian soldiers surrendered to Turkish troops. At Kut-al-Amara (Al-Kut), halfway to Baghdad, the Turks annihilated the 6th Indian Division. Then they gutted three more British divisions that tried to drive up the Tigris River. These humiliations made the Mesopotamian war a matter of honour for some of the British generals. Johnny Turk had to go, no matter what. The newly appointed British commander in chief Lieutenant-General Sir Frederick Stanley Maude (PICTURE RIGHT) changed the Mesopotamian scene within a year from one of despair to one of victory. The British had been, since November 1914, in the possesion of Basra, in the south of Iraq, and held its oilwells. They had also occupied the terminal of the oil pipeline and the refineries on the island of Abadan in the river of Shatt El Arab, in the south-western corner of Persia (Iran). Chief William Robertson of the Imperial General Staff wanted to keep it that way. He had ordered a defensive strategy: safeguarding these oilfields was first and only priority. Robertson did not even think about conquering Baghdad and the other large oilfields in the north, near Kirkuk and Baku. But after long talks Maude persuaded him to march. The Mesopotamian Expeditionary Force kept the preparations for the new campaign as secret as possible. In December 1916 the 'imperceptible' offensive began in Basra, and it went swift and succesful. Maude crossed the river Tigris, defeated the Turks who had entrenched themselves along the shores, recaptured Kut-el-Amara and went on to Baghdad. The capture of Baghdad was somewhat of an anticlimax. Maude expected fierce resistance and he had worried that the defending commander, Kâzim Karabekir Pasha (PICTURE RIGHT), would flood the plains in front of the city. Instead Karabekir was indecisive and moved initially to meet the 50,000 British troops head on. The Turkish commander then suddenly changed his mind and opted to defend the railway station. This allowed the British troops to advance close to Baghdad without suffering heavy losses. Karabekir's mistakes led to the defence of Baghdad becoming almost impossible and the Turks ordered a general retreat. More than 12,000 Turkish troops fled. By the time the British entered the city, on the 11th of March, there were only 9,000 Turkish soldiers remaining. They surrendered rather than put up a fight. "People of Baghdad, remember for 26 generations you have suffered under strange tyrants who have ever endeavoured to set one Arab house against another in order that they might profit by your dissensions. This policy is abhorrent to Great Britain and her Allies for there can be neither peace nor prosperity where there is enmity or misgovernment. Our armies do not come into your cities and lands as conquerors or enemies, but as liberators." The photograph above was taken the next day, on 12th March. It shows the 1st Division of the 4th Hampshire Regiment entering the city past a crowd of local onlookers. The division was, in fact, based at a garrison just outside Baghdad and was ordered to march into the city specifically for the purpose of this staged photograph. The picture illustrated an article on the proposed League of Nations in the National Geographic Magazine of January 1919. That was just a few weeks after the Great War had come to an end. "We fought this war and are reorganizing these new goverments for the purpose of maintaining a democratic peace; but if continual quarrel and war are to succeed these changes on the map, the purpose of the war and the treaty will fail." The defeat of the Turks meant the end of the Ottoman Empire. The winners of World War I divided the "near east" among them, with the new League of Nations giving Britain a mandate to run Iraq (as well as Trans-Jordan, Palestine and Egypt). This disappointed Arab nationalists who had hoped for independence in Iraq and elsewhere. In 1920, after a troublesome rebellion led by Iraqi nationalists (which left hundreds of British soldiers dead), Britain installed their figurehead Prince Faisal (PICTURE RIGHT) as king of Iraq. During the Great War Feisal and his friend Colonel T.E. 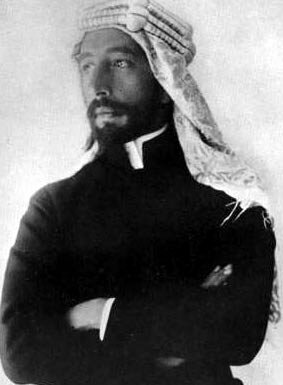 Lawrence (of Arabia) had been leaders of an Arab bedouin army that had harassed the Turks. King Faisal promised to safeguard British oil-interests and he indeed granted large oil-concessions to British firms. For that Britain paid him £ 800,000 per month. 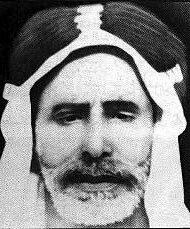 Despite Faisal's Islamic and pan-Arab credentials, however, he was not an Iraqi and nationalists viewed the monarchy itself (Iraq had never had a king) as an illegitimate British-created institution. Running Iraq proved expensive and troublesome for the British, despite the oil concessions. In 1929 a newly elected British Labour government promised independence and in 1932 it was granted, with Faisal as king. One year later Faisal suddenly died. In 1941, during World War II, Iraqi army commanders staged a coup d'etat under the nominal leadership of Rashid Ali al-Gaylani (PICTURE RIGHT), who was suspected by the allies of pro-German sympathies. In the eyes of London the coup threatened the vital oil supply from the northern Iraq oilfields upon which the British warfare in the Mediterranean depended. 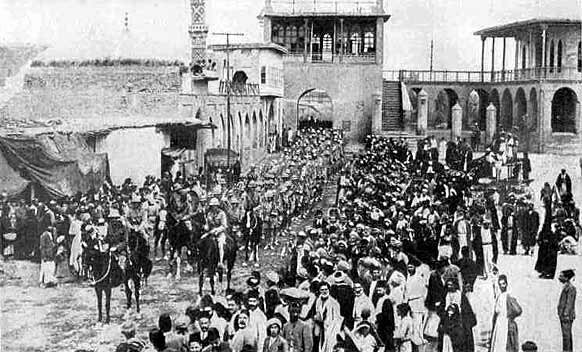 British and Indian forces landed in Basra and headed for Baghdad. At the same time the British-run Arab Legion marched from Transjordan and attacked Rashid Ali's troops in the West. The Iraqi army, fighting from behind defense lines organized along canals and fields flooded from water unleashed from tributaries of the Tigris and Euphrates, put up a respectable resistance. They also got support by Italian aircraft. But on 30th May the allied forces scattered Iraqi units on the outskirts of Baghdad. To avoid the prospects of a house-to-house street battle, the British general Clark opted for bluff—an interpreter phoned Rashid Ali's headquarters with exaggerated reports of British strength. The Iraqi leader panicked and, with the Grand Mufti in tow, scuttled to Persia. The British signed a lenient armistice that allowed the Iraqi army to retain its arms and return to its peacetime garrisons. From then on Iraq cooperated with the allies. During the war there were several pogroms on the large Jewish population in Baghdad, inspired by the German ambassador. After the war, in the early 1950s, the majority of the Jewish population, who were present there since the city’s founding, left on organized flights to Israel. The city was the scene of another coup in 1958 let by General Abdul Karim Qassim, a nationalist officer. He overthrew the monarchy and established a republic. In 1963 Qassim was overthrown by officers of the Baath Party. The Baath Party took control of virtually all aspects of Iraqi society. The architect of that program was Saddam Hussein, who officially became president in 1979. 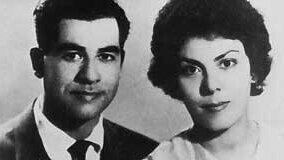 PICTURE RIGHT: Saddam Hussein with his wife Sajida Khair-Allah in 1979. On 22nd September 1980 Iraqi armed forces invaded western Iran along the countries' joint border. Iraq tried to seize control of the rich oil-producing Iranian border province of Khzest. Iraq's war effort was openly financed by Saudi Arabia and tacitly supported by the United States. Its international reputation was damaged by reports that it had made use of lethal chemical weapons against Iranian troops. The war carried on until 1988 when both countries accepted an United Nations-mediated cease-fire. On 16th March 1988 Saddam Hussein launched a chemical weapon attack on the Kurdish town of Halabja. It was part of a campaign to ethnically cleanse areas of minority Kurdish populations. Casualties of the attack numbered around 5,000. Doctors estimate a further 1,600 have died from long-term affects of the attack, and 15,000 still suffer from complications caused by the mustard, nerve and cyanide gases, such as cancers, infertility, respiratory diseases, blindness and birth defects. On 2nd August 1990, Iraqi forces invaded Kuwait. Saddam Hussein declared that Kuwait had become the 19th province of Iraq. In January and February 1991 a 28-member coalition, including several Middle Eastern states and led by the United States, compelled Iraq to withdraw from Kuwait. Since then the international community has urged Iraq to get rid of its chemical weaponry. In March 2003 the United States and Britain invaded Iraq to destroy these so-called Weapons of Mass Destruction and to remove Saddam Hussein from office. The city of Baghdad fell on 9th of April. The Americans resumed oil export on 23rd of April. Weapons of mass destruction were not found. The population of Baghdad has increased dramatically over the last century. In 1917 there were 140,000 inhabitants, while today's figures (2003) have an estimate of between 4 and 5 million. The majority are Muslims, and Arabs. There is also a substantial Christian population, and still a tiny Jewish population.